A’s fans Eli Branden, left, and Jim Angelus from San Francisco come prepared to the Coliseum after the Frank Francisco chair-throwing incident. It's not too late to get into a Fantasy Sports League. Sign up here. The heckling hurricane was gone from Oakland, sweeping south to Los Angeles and the Dodgers' home park in Chavez Ravine on Tuesday night. Just about the time Dodgers right fielder Milton Bradley went berserk in the eighth inning, picking up a plastic bottle that was first thrown at him and slamming it into the right-field seats of Dodger Stadium, it was the seventh inning in Oakland. And in the infamous bullpen area where an ageless debate unfolded, it was quiet as a Coliseum mouse. There was no Craig Bueno, the newly notorious loudmouth whose words sparked so much fury in Texas Rangers pitcher Frank Francisco that he hurled a folding chair into the stands Sept. 13, breaking the nose of Bueno's wife, Jennifer. There was no chaos, just a five-run Seattle Mariners lead that seemed to deflate any windbags who had come to blow hard. The only hint of heckle came from Josh Tefigueirego, a 29-year-old PG&E programmer by day who is working on Mariners relievers Ron Villone and Scott Atchison on this night. "It's bush-league time," yelled Tefigueirego, seated four rows back and wearing a green A's jacket and visor. "Hey, what are you guys doing in October? Working on your résumé. ... You got plans for the fall, Villone? ... Hey Villone, show us the home-run pitch." Tefigueirego leaves with his father an inning later, content if only because he didn't take the A's loss piping down. "It's a good time, because you actually feel like you had an impact on the game," Tefigueirego said. "If a pitcher gives you recognition, or goes and blows the game, you feel like you might have made a difference." Somewhere, Francisco is shaking his head. When it comes to the war of words between fans and the baseball players they pay to see, a round table might work better than a folding chair. A discussion is in order. Neither side seems to understand the other's problem, the ones who yell or the ones who yell back. Some fans say no insult warrants retaliation, that the players' huge salaries should heal any emotional wounds inflicted by harsh words. Players say the price of admission doesn't include bad-taste insurance and wonder how members of this group find joy in their own badgering banter. The two sides agree only on the unwritten rules of heckling: no profanity, no personal attacks, witty remarks recommended. Yet someone, it seems obvious, has been crossing the line. "I don't think it's a classy thing to do, to be honest," A's rookie shortstop Bobby Crosby said. "I'd like to see a role reversal, have someone get on these guys at their jobs, whatever they do. I think there could be more positive things to do at a game." A's outfielder Eric Byrnes is among the few players who relate to some hecklers. He grew up a Giants fan in the Bay Area, and admits to spitting barbs at opposing left fielders from the Candlestick Park bleachers. While in college at UCLA, Byrnes even made friends with hecklers from the University of Texas. With his beach-blond wavy hair, Byrnes was dubbed "California boy" and "surfer dude" by the Longhorns' faithful atop motor homes just beyond the outfield fence. They played the Beach Boys' song "Surfin' Safari" during one game, riding imaginary waves while Byrnes laughed hysterically in the field. But this year in Boston, there was nothing funny about his experience at Fenway Park. For much of the game, Byrnes said four men chided him in the outfield. Afterward, the same men followed Byrnes and two of his non-baseball friends outside the stadium. "It got a little hairy," Byrnes said. "They kept talking and talking, and finally we just went to our cars. We were ready if they came up from behind us. That wasn't too fun, and it's probably the extreme of it." For many fans, heckling is their only chance to play a role in a major-league baseball game. During the news conference that followed the Francisco incident, Bueno called heckling an "American tradition." 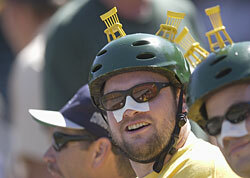 Longtime A's fan Gene Sunnen calls it an art. In July, Sunnen taught a seminar for the Society for American Baseball Research titled "The Art of Heckling." There's even a Web site dedicated to the obnoxiously loud and sometimes clever, http://www.heckledepot.com/. Just like the players themselves, most hecklers have career highlights. At some point, they are convinced, they've entered the athletes' heads, forcing miscues with their verbal attacks. Dodgers game. "He booted a ball, and it was us who did it. You do whatever it takes. ... We don't have any other way to express our love for the game." Tefigueirego and his father, Joe, are part-time A's season-ticket holders. They sit mostly near the visitors' bullpen, where their best performances have come against Anaheim. Angels reliever Brendan Donnelly didn't care for Tefigueirego's "bush league" line, shouting back, "Pay attention to the game," while warming up. "And one time (Angels closer) Troy Percival just blew it, throwing two pitches into right field," Tefigueirego said. But the poor play of Francisco and Bradley was much worse. For his part, Francisco was suspended 15 games; Bradley earned five games, lasting until the end of the regular season. The A's, in turn, have become hypersensitive in their attempt to avoid further problems at the Coliseum. Despite placing all the blame on Francisco publicly, one usher said staff and security has been "tripled" since the incident to monitor fans. While fans are free to roam most of the stadium, ushers check every ticket of the lower sections near the visitors' bullpen. While reporting for this story, five security and staff members escorted a Bee reporter out of the viewing area and nearly out of the stadium. "They've got a microscope on us," said the usher, who spoke on condition of anonymity because he claimed he could be fired for letting anyone sit there without a ticket. "It's crazy." And Vincent Moralez thinks the same about the player's reaction that started it all. The 23-year-old Sacramento resident and A's fan said he could take heckling for the money most players make. han's cousin. "That's why these guys get paid so much, I think." Not surprisingly, a player disagrees. A's pitcher Rich Harden said it's less about money than it is humanity. "It's almost like teasing a caged animal or something, throwing stuff at it, aggravating it," Harden said. "It can't do anything. It's helpless. That's like us out there. "I don't see why people (enjoy) it, whether it makes them feel powerful or good in front of their friends." Sunday at SBC Park, Dodgers left fielder Jayson Werth and Giants fans played a head game with different sets of rules. When Werth was within earshot, he was bombarded with a chorus of "Werth-less." Then after hitting a two-run home run in the first inning, Werth shot a hard glance toward the bleachers, a gesture with one meaning to him and another to them. "If they respond, or pay attention to you, it means they're listening," Callahan said. "You feel a lot better." Werth had a different take. "All I've got to do is look back there, and I get in their heads," Werth said. "But as far as them getting in my head, messing me up, that's not going to happen."